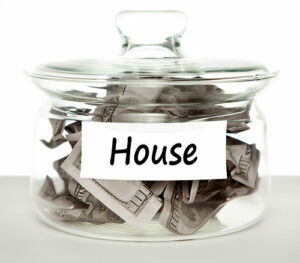 Putting money aside in order to purchase a home is a complex issue, which takes several distinct factors into account. For one thing, it directly relates to the size of your household budget, as well as to your ability to save money for the downpayment. There’s no simple and single answer to the question of ‘how much downpayment for a house?’ either. Several personal finance experts have tried to determine a so-called ‘how much house can I afford?’ rule of thumb, only to come up with a variety of answers. For the sake of bringing you the best in first time home buyer tips, we’re also listing such a rule – only it’s more like four rules wrapped up into one. Take the following information as generic and not necessarily applicable to all scenarios. When you apply for a mortgage, lenders will look at how much income you’re making, how stable it is, how healthy your credit history is, as well as at the amount of money you can spend upfront, on the mortgage down payment. ‘All right’, you’ll say, ‘then at least tell me how much is a downpayment on a house, so I can figure out how much money I should be saving. Well, as anyone who’s ever taken an interest in applying for a home loan knows, it would be next to impossible, as well as completely irrelevant, to calculate the average down payment on a house. That’s because how much you should save doesn’t depend solely on your first time home buyer down payment. Don’t worry, though – we can provide you with some specific information in this list of tips for first time home buyers. It, too, varies from one source to the next, yet it might turn out helpful after all is said and done. CNN’s financial experts advise buying a home whose purchase price is 2.5 times your gross yearly paycheck. To play it even safer, follow the advice of the Washington Mutual Bank, which said most buyers can afford a house valued at up to three times their total gross yearly income, with a 20 percent downpayment and a modicum of other long term debt amassed, from, say credit cards and other loans. By and large, this translates into the fact that you can likely afford a home that’s worth 4, or even 5 times your yearly income. You can crunch your own numbers, or create a set of general rules, based on the average American household, current interest rates, and FHA home loan eligibility standards. According to the FHA, acceptable loans take into account a front-end debt-to-income ratio of under 31 percent. This means the mortgage PITI (i.e. principal, interest, taxes, and insurance) divided by your gross household income, should amount to 31 percent tops. Then, divide the expected mortgage monthly payment and all your other debt by your gross income. The result, a.k.a. the back-end debt-to-income ratio needs to be 43 percent tops. Based on the above assumptions, you’ll note that a mortgage with a 20 percent downpayment and a 31 percent front-end ratio will require you to save 5 times your gross income to afford it. Similarly, a 20 percent down payment home loan with a 43 percent back-end ratio, as well as a 5 percent downpayment with a 31 percent front-end ratio, will lead you to home loan expenses that total 4.4 times your household’s annual income. If your back-end ratio is 43 percent and you’re applying for a 5 per cent down payment house loan, your total price and loan size will amount to about 3.1 times your gross income. To conclude, there are far too many variables involved in mortgages to determine a catch-all rule of thumb for saving; however, anywhere between 3 to 5 times your yearly income is probably a good place to start.